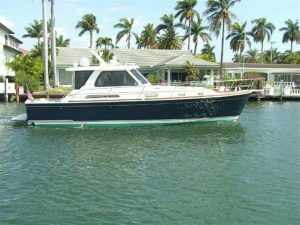 The owner of this 42' Sabre yacht for sale in Florida is motivated to sell! : Atlantic Yacht & Ship, Inc. The owner of this 42′ Sabre yacht for sale in Florida is motivated to sell! Dennis Rhodes brings news of a price reduction on the beautiful used 42′ Sabre for sale! In the first place, this used 42′ Sabre known as “Sundowner” was launched in 2005. As can be seen, this boat is loaded with all the right features and upgrades. After all she has desirable Caterpillar C-9 diesel engines. In fact, these engines are able to push her to cruise in the mid-twenty knot range! This beautiful used 42′ Sabre has been priced to sell. Altogether she sleeps four guests in her two staterooms. Also, the master stateroom is forward with an island queen-size berth. Of course the master suite has a private head. The guest stateroom is starboard and has a lower berth. Together with the saloon which has teak and holly wood floors. You will love these as they are very functional. Furthermore with an enclosed upper deck has 24,000 BTUs of air conditioning to keep you comfortable. This boat shows great as she has been cared for by a knowledgeable owner. For more information on this classic used 42′ Sabre be sure to contact Dennis Rhodes today! This 68′ Azimut Evolution Yacht for sale is motivated to sell! This 50′ Hatteras Yacht is motivated to sell!